I didn’t even have to take this one out of the box before I noticed the sweet juicy orange and spicy warm clove scent and I was immediately thrown back to 2nd grade in Miss Trouts classroom. We made Orange Clove Pomanders for our mothers for Christmas, I know, that’s quite a throwback and a random thing to bring up, but you know what they say about fragrance and its most powerful aspect, is its ability to resurrect long forgotten memories! Needless to say, the cold throw on this candle is superb, it will tinge a room with the sweet smell of fall and the approaching holidays merely by sitting unlit on the counter. Light it up and wow! The warmth of the clove and cinnamon mingle so beautifully and take me straight into fall. If I didn’t live in Southern California where it is still in the low 80’s, I would light a fire, pour a nice glass of Cabernet and snuggle up in that big chunky knit throw that so rarely makes an appearance in my living room. But at least I can enjoy the scent of fall, as I sit in my cutoffs enjoying another warm and sunny day with a chilled rosé close at hand. The whole walk down memory lane that this candle inspired took me off on a bit of a journey. I was looking up all of the different ways to make Pomanders. Even Martha Stewart has a video on how to make Pomanders for holiday gifts. Trust me, the ones I made back in 2nd grade looked nothing like hers! I also learned that Pomanders date back as far as the 13th century and were actually worn or carried about, and some consider them an early form of Aromatherapy. I think for me, I’ll just stick with the Trapp Orange Clove Candle, it’s easy, I just light it and my whole place takes on the magical veil of Autumn. 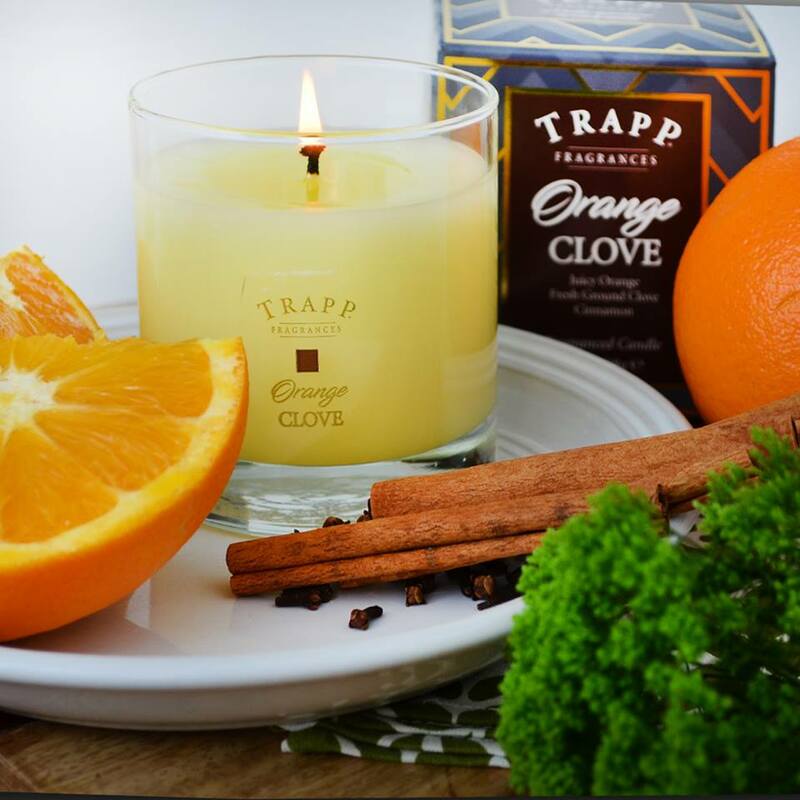 This Trapp Orange Clove candle blends juicy orange and freshly ground clove to warm your senses. If you like Trapp Orange Vanilla, you will love this Orange Clove candle through the fall, winter and holiday season. 7 oz. 50 hour burn time.